I knew I had to give it a try. Below are the couple pics I remembered to take. and also cut the onions the night before and threw them in a ziplock in the fridge. I even mixed up the sauce the night before so all I had to do in the morning was dump it all in the crock pot. Prep the night before made it easy to dump in the next morning. Verdict: It was delicious! The sauce was incredible - especially on the mashed potatoes. 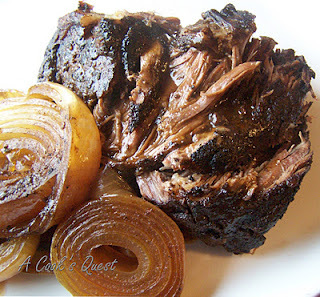 The onions were tender and sweet and the perfect compliment to the roast. Clearly its repeatable - I've made it again! Things to note/consider: The first time we had it, Joe made the sauce. He did a much better job. When I tried to separate the fat the second time we had it, I don't think I got one bit out. As a result, the sauce was sort of thin. Still good, but it was better the first time. To make it even easier to throw together, I had the potatoes peeled and chopped and sitting in water overnight, so they just had to be drained/rinsed and boiled while the sauce was being made. It was a delicious weeknight meal that tasted like it took a day's worth of cooking. The leftovers were great too. Highly recommended! Rub meat well with seasoning salt, onion powder, garlic powder and black pepper. Heat heavy pan with small amount of olive oil and brown roast well on both sides. This will take a few minutes; don't rush the browning step. Place onions in bottom of slow cooker. Put meat on top of onions and pour beef stock mixture over. Cook on low for 6-8 hours, until beef is tender. The meat might be partly submerged in liquid after this much time. Remove meat from slow cooker and cover with foil to keep warm. Drain liquid from Crockpot and remove as much of the fat as you can with fat separator or skimmer. Cook down liquid by about 1/3, and serve sauce with meat and onions. In other news, I still have a large backlog of things to post. I hope to catch up this weekend to get some more current stuff up here. Also - my amazing husband got me a fancy new camera for my birthday so the picture quality from me should get better (once I figure it out!). Have a great weekend everyone!